Factory farms, otherwise known as Confined Animal Feeding Operations (CAFOs), are one of the worst examples of industrial agriculture. These operations treat animals like machines, exploit farm workers, rely on dangerous inputs such as biotech feedstock and subtherapeutic antibiotics, produce food that is often unsafe for consumers, and also generate massive environmental pollution in the form of manure runoff and toxic fumes. In recognition of this year’s expo theme of “Around the World in Dairy,” Family Farm Defenders will be presenting two special cow pie plaques to two entities that are not even from Wisconsin, yet enjoy enormous influence here, across the U.S, and even beyond our borders. This is part of the second annual Wisconsin ” Land of 10,000 Lagoons” award ceremony which celebrates the worst violators of the public trust and ecological stewardship in the state through the reckless promotion of factory farms and industrial agribusiness at taxpayer expense. As early as 1996, the American Legislative Exchange Council (ALEC) based in Washington DC began pushing factory farms through its model “Right to Farm” legislation that was soon cropping up in state capitols across the country. This work helped set the precedent for preemption, where state laws such as Wisconsin’s own Livestock Siting Legislation can trump any township or county regulations, eroding local democracy and basically forcing communities to accept factory farms whether they like them or not. For more on ALEC’s amazing influence, review the article by Jill Richardson below. A bit newer to the Wisconsin scene is AFACT – American Farmers for the Advancement and Conservation of Technology – that was launched by the marketing firm, Osborne & Barr at the World Agric. Expo in Tulare, CA in 2008 with support from Monsanto. Nonetheless, AFACT has taken the dairy world by storm by recruiting a cadre of ambitious WI spokespeople including Liz Doornink, Laura Daniels, and Daphne Holterman. Even though Ms. Doornink has had to deal with some rather unfortunate manure spills on her own factory farm of late, this has not put any real brake on Monsanto’s impressive astroturf organizing. For more details on AFACT, check out John Kinsman’s op ed below. Last year’s first annual Wisconsin “Land of 10,000 Lagoons” Award winners included: Rosendale Dairy in Fond du Lac County in the category “Most Manure in One Location and Most Cows Held in Confinement;” Dane County’s “Community” Manure Digester in the category of “Most Taxpayer Subsidies in the Bank;” and the Dairy Business Association in the category of “Most Powerful Factory Farm Lobbyist at the Capitol.” It is hoped these awards will become a popular tradition at many world dairy expos to come. Following the “10,000 Manure Lagoons” ceremony, Wisconsin citizens will have an opportunity to speak out about how they have been affected by environmental pollution, health threats, political corruption, and other problems emanating from factory farm expansion statewide. On Sept. 7th, 2011 the Country Today ran an op ed by Heidi Clausen titled “Gore, Prince Charles Need Reality Check on Farming.” Unfortunately, Clausen neglected to do her homework before writing this article since it basically parrots the half truths spread by various front groups for corporate agribusiness. One of these front groups that is quite active in Wisconsin and is heavily bankrolled by Monsanto is AFACT – American Farmers for the Advancement and Conservation of Technology. In her article Clausen states “England’s choices have routinely scared off proposals for modern dairy and hog operations, making that country largely dependent on other nations to feed its roughly 60 million residents.” The implication is that the only way to feed the world is through industrial agriculture and its technologies: recombinant bovine growth hormone (rBGH), biotech crops, pesticides, synthetic fertilizers, antibiotics, and so on. A major international study in 2008 sponsored by the World Bank and five U.N. agencies says otherwise. The International Assessment of Agricultural Knowledge, Science, and Technology for Development (IAASTD) was conducted by 400 respected scientists and development experts from more than 80 countries and its results have since been endorsed by 58 countries. They concluded that “conventional industrial agriculture is degrading the world’s soils and other natural resources, and now threatens water, energy, and climate security.” A study by the Univ. of Michigan, comparing data from almost 100 other studies of conventional and sustainable agriculture, also concluded that a worldwide switch to sustainable organic agriculture could actually increase global food production as much as 50%. That is enough to feed a population of 9 billion people without access to any extra land. In reality, it has been British policy to encourage factory farm expansion at the expense of family farms, even when these smaller sustainable operations fed more people. On separate occasions as I’ve traveled across England, I’ve seen these industrial confinement facilities and the dangerous consequences they bring. Prince Charles does not have the power to set farm policy in the U.K., and if he did he would certainly choose small scale sustainable family farming. Powerful transnational corporations like Monsanto are the ones dictating destructive food and farm policies in the U.K. just as they do in the U.S. and many other countries. In order see their influence, just follow the money and watch how their “investment” pays off when it comes to public policy. Here in Wisconsin several dairy farmers who often appear in the media speaking in favor of industrial agriculture are actually AFACT figureheads. These individuals include Liz Doornink, Laura Daniels, and Daphne Holterman. A July 8, 2011 article in the River Falls Journal reported that Jon-De Farms near Baldwin, WI, owned by Liz Doorninck, spilled liquid manure from a broken pipeline into the Rush River. According to the DNR, such manure spills from Jo-De Farm have happened several times before. Nonetheless, Doornick was awarded the Dairy Woman of the Year award at the 2010 World Dairy Expo. 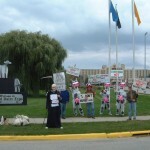 According to AgriView (9/23/11), she received the award because she sets “the standard for intelligence and commitment to the dairy industry.” Daphne Holterman, who owns Rosy Lane Dairy near Watertown, WI, won the same prize the year before, and has been hard at work for AFACT in Wisconsin countering the criticism of industrial agriculture by authors like Michael Pollen, who was met by protesters when he spoke to 8000 people at UW-Madison’s Kohl Center in Sept. 2009. Laura Daniels, one of the organizers of this protest, owns Heartwood Farm near Cobb, WI and works part-time as a nutritionist for Vita-Plus, is also on AFACT’s national leadership team. As more food safety and environmental contamination disasters occur, farmers and consumers are perfectly justified in rejecting dangerous technologies like rBGH and Round-Up that members of AFACT are paid to promote. That is why sustainable smallscale agriculture – not largescale industrial agriculture – is the fastest growing segment of farming today. If anyone needs a reality check, it is AFACT. As suburbs engulfed the rural landscape in the boom following World War II, many family farmers found themselves with new neighbors who were annoyed by the sound of crowing roosters, the smell of animal manure, or the rumble of farming equipment. In defense of family farming, Massachusetts passed the first “Right to Farm” law in 1979, to protect these farmers against their new suburban neighbors filing illegitimate nuisance lawsuits against them when, in fact, the farms were there first. Since then, every state has passed some kind of protection for family farms, which are pillars of our communities and the backbone of a sensible system of sustainable agriculture. However, in the past few decades, intensive corporatization of farming has threatened both the future of family farming and the ability of neighbors to regulate the development of industrial agricultural operations that have transmogrified many farms into factories. Small-scale farms that resembled Old MacDonald’s farm (with an oink oink here and a moo moo there) have increasingly disappeared or been turned into enormous livestock confinements with literal lagoons of liquified manure and urine, super-concentrated smells that could make a skunk faint, or vast fields of monoculture crops grown with a myriad of chemicals and pesticides and sometimes even sewage sludge. For example, the decade before the first right to farm law was passed, it took one million family farms to raise nearly 60 million pigs but by 2001, less than ten percent (80,000 farms) were growing the same number of pigs. Capitalizing on the sentiment of protecting traditional farming, giant agribusiness interests have convinced some states to revise their Right to Farm laws to stealthily protect the most egregious of industrial farming practices from legitimate nuisance suits. The Center for Media & Democracy has recently exposed and analyzed a cache of bills voted on by corporations and politicians behind closed doors and then introduced in state legislatures without any notice to the public of the role of the American Legislative Exchange Council (ALEC) bill factory in the production of the legislation and no disclosure of the fact that corporations pre-voted on the bills, let alone disclosures of the names of those companies. In 1996, ALEC suddenly took an interest in expanding right to farm laws. ALEC’s corporate backers, unsurprisingly, hale from the factory farm side of the equation. ALEC’s corporate members and funders have included a number of agriculture interests, including Archer Daniels Midland (ADM), Cargill, and DuPont, as well as industry organizations like the National Pork Producers Council, the Illinois Corn Marketing Board, and the Illinois Soybean Association. Cargill is the nation’s second largest beef processor, third largest turkey processor, and fourth largest pork processor. In three other areas, flour milling, soybean crushing, and production of animal feed, ADM joins Cargill as the biggest in the industry. Chemical giant DuPont is one of the world’s largest makers of numerous pesticides, and in 1999, it purchased seed giant Pioneer Hi-Bred, the world’s top seller of corn seeds, including genetically engineered seeds. Unlike the corporations, the National Pork Producers Council (NPPC) is actually led by farmers … and lobbyists for multinational pork processors, like Don Butler, past president of NPPC and lobbyist for Smithfield Foods, the largest pork processor in the world. The farmers who lead NPPC tend to own farms similar to that of NPPC president Doug Wolf. Wolf’s farm produces 24,000 hogs per year – and it also has a beef feedlot and 1,200 acres of corn, soy, and alfalfa. Some businesses and farm owners expressed concerns over the health of their employees, some of whom would be housed within 300 feet of Koch’s cattle pens. Other neighbors cited concerns over the potential for groundwater pollution, the amount of dirt, insects, and odors added to the area contributing to health problems, a decrease in the quality of life for nearby residents, and the possible devaluation of land. Koch overcame their objections with the ruling of a friendly regulator in Texas, winning the right to expand. With all these corporate interests in limiting regulation of factory farming, thank goodness their pals at ALEC approved a model version of a Right to Farm bill in 1996! While nearly all farms in the United States are technically “family farms” (a tiny fraction are owned directly by corporations), multinational agribusiness corporations have a major stake in how these farms are operated. Often family farms take the form of Wolf L & G Farms LLC, the farm owned by the family of Doug Wolf (mentioned above). Particularly for chickens and hogs, individual farmers often contract with meatpackers like Cargill, Smithfield, or Tyson. In contract farming arrangements, the corporations provide the animals, medications, and feed to the farmers; the farmer is responsible for the animals’ housing, manure, and the bodies of animals that die prematurely. When the animals are fully grown, they are picked up by the corporation, which slaughters, processes, and markets the animal and plays the farmer for the weight the animal gained in his or her care. The farmers have most of the debt and risk and the corporation has most of the power and profit. Because the corporations tightly control the conditions in which the animals are raised (specifying how housing is constructed and the use of certain medications, etc., in the farmers’ contracts), they would be affected by nuisance claims by neighbors against the conditions they require of the farms. And because they need enough contracted farms in the vicinity of their slaughterhouses to keep the slaughterhouses operating year round, they would find themselves in a pickle if neighbors – and even fellow small farmers – who suddenly found their neighborly family farm mutated into an industrial agriculture operation were able to challenge and shut down animal factories. For non-contract farms, agribusiness corporations’ stake in the farms is much more straightforward. They want as many farmers as possible to buy and use their products (or in some cases involving sewage sludge, take the product for free!). If genetically engineered crops, aerial spraying of pesticides, or application of sewage sludge were banned in an area – or subject to nuisance suits from upset neighbors – agribusiness would have to adapt in response to local concerns. In ALEC’s model bill, neighbors may not intervene in a farm’s practices so long as the farm conforms to “generally accepted agriculture and management practices.” Furthermore, anyone who brings a nuisance suit against a farm and loses must pay the farm’s attorneys’ fees and any other costs incurred by the farm as a result of the lawsuit. While such changes would undoubtedly benefit small family farmers, the changes seem much more beneficial to the huge factory farms that were emerging in the 1990s and that dominate the market today. In 2005, Indiana Senate Republicans Bob Jackman, Vic Heinold, and Brandt Hershman introduced an update to the state’s Right to Farm law that inserted language similar to that of ALEC’s mode Right to Farm Act, shielding a farm from nuisance suits even if it changes in size or adopts a new technology. Both Hershman, who is currently the Indian Senate Majority Whip and a member of ALEC, and Jackman are farmers. Jackman operates a contract hog confinement. Heinold, while not a farmer himself, works in corporate agribusiness, and ultimately left the Senate before the end of his term in order to pursue a career with a multinational grain shipping company. A local community that is unhappy about groundwater pollution from a large animal confinement or odor and health problems caused by a farmer spreading sewage sludge on his fields might try to pass local ordinances that prohibit those practices. Or could — until 16 states added bans on any local laws that are stricter than the state’s laws. Those states are: Alabama, Arkansas, Colorado, Florida, Idaho, Kentucky, Louisiana, Maine, Michigan, New York, North Dakota, Oregon, Pennsylvania, South Carolina, Utah, and Virginia. Obviously, barring neighbors the ability to file a lawsuit over water pollution, air pollution, by-products or waste products of agricultural processing, and the fumes from the use of manure or other “nutrients” is very far reaching. One product that seems likely to implicate several of these aspects is sewage sludge, which comes from both industrial and human waste flushed down the drains. Over the past several decades sewage sludge, ruled too toxic to dump in oceans, has been promoted has a fertilizer for farms and gardens. Dioxins, PCBs, medical wastes, industrial solvents and chemicals, heavy metals, endocrine disruptors, flame retardants, and pathogens have been found in sewage sludge and sewage sludge derived products marketed to farmers and gardeners (often without any disclosure that the products are made of sewage sludge). Extraordinary odor is just one of the negative attributes of sewage sludge but it is a powerful one. Craig Pataky, a resident of Cottage Grove, Oregon, describes the stench of sewage sludge by saying, “It smells like all the residents of Cottage Grove are taking a crap in a field right down the road.” Another Cottage Grove resident, Les Moore, links health problems to the smell. “It was so acrid that I had a severe headache. Never have a bad headache. And I was that close to throwing up,” says Moore. A year before, residents of Rio Vista, CA, had the same problem when a nearby farm spread sewage sludge on its fields. “It made you feel energy-less,” said Bob Tillisch, a Rio Vista resident who complained about the smell. Sewage sludge, as a currently legal agricultural practice despite the objections of many people, is one of the many “nuisances” covered by Right to Farm laws. What other practices might be barred from suit under the ALEC bill? Please help the Center for Media and Democracy identify additional examples. “Crowning Achievements and Golden Opportunities” may be the theme of the 2010 World Dairy Expo, but for many family farmers and rural residents across Wisconsin the continued taxpayer subsidized promotion of industrial style dairy operations has been an unmitigated disaster. “Local control has been stripped by the WI Livestock Siting Law. Concerns around neighborhood quality of life and rural economic health are completely absent from the process. We demand the return of our right to determine our own communities future,” says Edie Ehlert of Crawford Stewardship Project. There were only two factory dairy operations in Wisconsin twenty years ago, now there are over 150. Far from being a natural evolution of the dairy industry, this trend has been fueled by lackadaisical regulation, millions in subsidies, no environmental liability requirement, flagrant farm labor abuse, as well as blatant political corruption and corporate influence peddling. Legislation railroaded through in 2006 went even further, taking away local democratic control over livestock facility siting, and placing all power in the hands of an industry dominated task force appointed by the governor. Meanwhile, the DNR has yet to reject a single factory farm permit that crosses it desk, even when some of these facilities generate more sewage in an entire year than entire cities. “The relaxation and non-enforcement of laws designed to protect drinking water in Wisconsin is appalling. The fact that no meaningful DNR monitoring and enforcement exists speaks for itself,” comments Jennifer Nelson of Sustain Rural Wisconsin Network. The first annual 2010 Wisconsin “Land of 10,000 Lagoons” Awards were presented to four winners in the following categories: most manure in one location; most cows held in confinement; most taxpayer subsidies in the bank; and most powerful factory farm lobbyist at the state capitol. Most Manure in One Location and Most Cows Held in Confinement – This special double award went to Rosendale Dairy in Fond du Lac county which got DNR approval in 2009 to expand from 700 cows to 4,000 and now needs 5,600 acres of cropland to dispose of its whopping 46 million gallons of liquid manure per year. Even more impressive, Rosendale in 2010 received DNR approval, despite overwhelming public opposition, to expand again to 8,000 cows. Wow, it will be hard not to miss smelling that! Most Taxpayer Subsidies in the Bank – The 2010 award in this category goes to the Dane County “Community” Manure Digester! This massive facility built with over $3 million in state money and another $1 million from the county budget (total pricetag estimate $17 million) will address the “scourge” of manure created by four nearby factory farms who never let their cows outside to graze and compost their waste naturally on pasture. Sadly, the other 396 dairy farms in Dane County are not part of this “community” and will just have to wait their turn to get to this coveted taxpayer trough. Most Powerful Factory Farm Lobbyist at the Capitol – No real surprise here – the winner is the Dairy Business Association (DBA), which basically wrote their own rules and have a cozy revolving door relationship with state regulatory agencies. David Jelinski, who helped write and implement Wisconsin’s livestock siting law as director of DATCP’s Land and Water Resources Bureau, deserves congratulation on his promotion to become DBA’s government affairs director. And a special shout out is also due DBA executive director, Laurie Fischer, who cut a sweet deal via memo with DNR Deputy Secretary Patrick Henderson, back in March 2008 to speed up the permitting process for factory farms. No time to waste the state, literally! Following the awards, Wisconsin citizens who have been adversely affected by factory farm expansion spoke out about their experiences and also presented a list of demands to state regulatory agencies, as well as candidates for statewide political office. 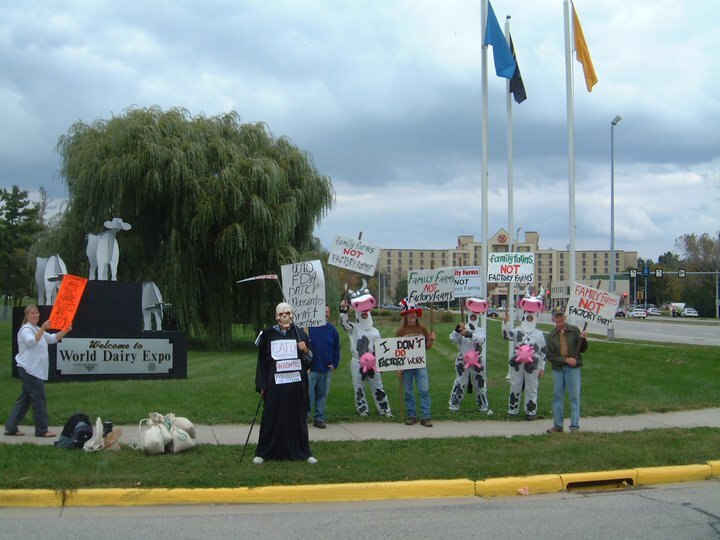 Others wearing cow costumes educated those entering the World Dairy Expo about the threat that factory dairy operations pose to Wisconsin, and even Pres. Obama was officially welcomed to the Land of 10,000 Lagoons as his motorcade passed enroute to UW-Madison. Many of those attending this event also took this important election year message to the crowd and media at the Farm Aid Concert, held at Miller Stadium in Milwaukee on Sat. Oct.
What is the latest taxpayer subsidized economic stimulus scheme? Why, manure digesters on factory farms, of course! At the U.N. Climate Change Conference in Copenhagen late last Dec. USDA Sec. Tom Vilsack unveiled plans to promote manure digesters as a way to reduce U.S. greenhouse gas emissions by 25% – the trick is that you have to be a factory farm to qualify. In his State of the State address in early Jan., WI Governor, Jim Doyle, also announced his latest round of fresh tax credits for factory farm expansion, including a whopping $6.6 million for two manure digesters in Dane County catering to just a handful of mega dairies. Dane County Executive, Kathleen Falk, has also been pushing for more taxpayer money in her own budget for these digesters. The total pricetag for the one proposed near Waunakee is over $17 million – just imagine how much good that money could do if devoted to promoting sustainable agriculture instead! The real tragedy is that manure digesters actually make global warming worse while “solving” a manure problem that would not even exist if cows were allowed to graze on pasture rather than being confined indoors. As Paris Reidhead documents in the Jan. 2010 issue of the Milkweed, methane is 21 times as bad as carbon dioxide when it comes to causing global warming, and this methane threat largely stems from factory farms that store liquid manure in lagoons under anaerobic conditions. In contrast, utilizing manure as compost under aerobic conditions reduces the “carbon footprint” of dairy cows by over 90%. Such common sense, though, does not make as much money for the corporate interests that now drive U.S. farm and energy policy. From Jan. 11th – 24th I was in Germany to speak on the dairy crisis in the U.S. as part of the International Dairy and Eco Fair Trade Conference in Berlin. Representatives from countries in Asia, Africa, and Europe all spoke on the problems now facing dairy farmers in their regions. Oliver du Schutter, special rapporteur to the U.N., church leaders, the EMB (European Milk Board) and others discussed the causes of the global dairy crisis and responses to it. In the following panel discussions we agreed on global strategies to raise farmgate prices and bring dignity to family dairy farmers. The EMB hosted the second half of my trip, including tours of dairy farms and milk plants. Our first stop was a 950 cow dairy on a former East German collective farm. The farm buildings and connected methane digester were several years old and received huge government subsidies to keep them operating. There were chronic problems with the digester and at the time the mixer in the tank was broken, requiring special scuba divers to repair it. The conditions were so bad that the divers could only remain in the tank for an hour. Similar problems plague manure digesters in Wisconsin, which always seem to be on perpetual high tech life support. While in Germany we also toured newer 600-800 cow dairies with digesters. The owners’ explained that the digesters operate like a cow’s stomach and need the proper bacterial balance to function efficiently. And for this balance, the farmers often have to add corn silage or other biomass material to the liquid manure. The owners explained that these digesters were simply not profitable without the five to ten year contracts that guaranteed huge government subsidies. As problems developed they were forced to install a newer more expensive system, and with that “fix” came newer problems. It seemed this treadmill was mostly designed to benefit sales people, technicians, and manufacturers of manure digesters, not family farmers or the environment. Without a fair milk price that actually covers their cost of production, many of the German farmers said they would not survive through 2010. The same crisis is facing dairy farmers in the U.S. who have endured a 50% decline in farmgate prices due to corporate control even as consumer prices for milk in the store have not budged and the dairy giants report record profits. In contrast, sustainable organic grass-based dairy farmers were a bit better off in Germany as they are in the U.S., though their future is not secure either. Numerous studies by Tom Kriegl of the UW Center for Dairy Profitability have shown that the most efficient dairy operations have less than 100 cows mostly outside and eating grass – yet, such a family farm is not large enough to qualify for taxpayer support and does not create enough manure to require a methane digester. On the last day of the Annual Congress of EDM (Germany’s largest dairy farmer group) over 1500 people were on hand in Berlin to hear Germany’s Agricultural Minister, Ilse Agner, give a pro-industry more free trade pep talk not unlike what U.S. farmers must endure from our own USDA Secretary, Tom Vilsack. In discussions afterwards, German farmers were shocked to hear that U.S. farmers were also suffering from low prices and repressive trade/farm policies just as they were. The USDA, industry, and the Farm Bureau had convinced them all that U.S. dairy farmers were prosperous. They had also been told that all U.S. dairy farmers were jumping on the factory farm manure digester bandwagon in order to take advantage of carbon credits – just a few of the many false solutions to climate change, including biotech crops, biochar, and agro fuels, that are now being pushed at public expense. As long as my tax dollars and those of other organic sustainable farmers are being used to bankroll schemes that just increase pollution for more corporate profit, there will be no economic recovery. Indigenous communities developed “earth-friendly” farming methods that kept our planet healthy for thousands of years. Many of these practices are being incorporated into family farming today around the world. In fact, a recent 2008 study by 400 scientists for the United Nations International Assessment of Agricultural Science and Technology for Development (IAASTD) concluded that small-scale organic agriculture is not only the best means to feed the world, but also the best response to climate change. Let’s stop wasting money on expensive digesters for a manure problem that does not need to exist, terminate factory farm subsidies, and put cows back outside on pasture where they belong. This will not only lead to fairer milk prices for family farmers and healthier food choices for consumers, but it will actually help spare the planet from climate change, too. Peck’s vision may sound implausible, like Godzilla rising from Lake Mendota to level the Capitol. Support for small-scale farming seems overwhelming in Madison, with its strong food co-op movement and a thriving Farmers’ Market, drawing 10,000 to 15,000 people to the Square to buy fresh produce from small farmers at reasonable prices. The emerging food system is based increasingly on factory farms or “confined animal feeding operations” (CAFOs). These often entail the heavy use of antibiotics to ward off the diseases that proliferate when thousands of animals are penned up in confined spaces. The CAFO-based model is most aggressively promoted by the Wisconsin Dairy Business Association. It brings together groups including the Wisconsin Farm Bureau Federation, Wisconsin Federation of Cooperatives, the Wisconsin Cattlemen’s Association, the Wisconsin Corn Growers Association, the Wisconsin Pork Association and the Professional Dairy Producers of Wisconsin. While the association portrays itself as the voice of dairy farmers who merely want to “Keep cows in Wisconsin,” much of its funding comes from corporate donors. Its website says they include Land O’Lakes Purina Feed LLC, Pfizer Animal Health, Accelerated Genetics, Wick Builders, Bayland Building, insurers, financial-service firms and a host of other agribusiness interests. Laurie Fischer, the association’s executive director, rebuffed repeated interview requests. She and the group’s communications director, Peggy S. Dierickx [see note at end], even declined to answer a set of emailed questions, claiming the press of other issues was too great. Likewise with the use of pesticides: “CAFO or no CAFO, raising corn and other crops means you have herbicides and pesticides,” Zimmerman maintains. “It’s the same regardless of farm size. In 1990, according to state Department of Natural Resources data, Wisconsin had just 20 CAFOs — defined as farms of 500 or more animal units (with 714 dairy cows equated with 1,000 animal units). Zimmerman says the state now has roughly 170 CAFOs, about three-fourths of them dairy operations. These operations account for an increasing share of the state’s agricultural output. In 2007, 28 dairy herds of 500 cows or larger — representing less than two-tenths of 1% of Wisconsin’s 14,200 dairy farms — accounted for nearly a quarter of all milk production in the state, according to data supplied by the state Department of Agriculture. CAFOs aim to raise profit by increasing the number of animal “units” producing revenue. These farms are operated as much like a factory assembly line as possible. “Larger farms have come into existence because it is easier to increase herd size than the land base,” says Prof. Thomas Kriegl of the UW Center for Dairy Profitability. Peck, a intensely energetic dark-haired man with a Ph.D. in land management from UW-Madison, says family-run farms in Dane County have confronted a daunting new set of pressures from the competition of “factory farms” actively promoted by state policy. Despite the noxious fumes, pollution worries and health concerns, some local officials are eager to “win” the location of factory farms in their jurisdiction because of added jobs and tax revenues. And for those local officials resistant to CAFOs, the State Livestock Siting Review Act of 2003 passed by the state Legislature and signed by Gov. Doyle prevents local authorities from blocking the construction of CAFOs. The law, which Doyle hailed as “a win-win for farmers and rural communities” and a triumph for “the right to farm,” establishes a seven-person board that can overrule local conditions on CAFOs as too restrictive. In January, Rock County Circuit Court Judge James E. Welker ruled that conditions set by the town of Magnolia were reasonable for a 1,500-unit dairy proposed by Larson Dairy. Although the town merely restated the state’s own standards for water protection, plant rotation and restrictions of manure spreading, the Siting Review Board had overruled it. Judge Welker declared that the board had acted “beyond its powers”; his ruling is now under appeal. The Farm Bureau’s Zimmerman downplays the impact of this ruling, saying it involved specific circumstances not likely to be found in other cases. But the judge’s decision is likely to further encourage anti-CAFO forces, which over the last year have been springing up across the state. “It seems like every CAFO is running into resistance around the state now,” says Schultz of Family Farm Defenders. Anti-CAFO campaigns are even cropping up in formerly politically placid areas like Viroqua and Taylor County. Mary Lippert, a veteran member of Family Farm Defenders, says that’s remarkable given people’s reluctance to engage in such battles. Zimmerman concedes that concerns about antibiotic use are fueling anti-CAFO sentiment. But, he asks, “Are CAFOs using more antibiotics? I don’t know.” He adds that the use of antibiotics is “not just an issue for CAFOs” but for all kinds of farms. She’s lined up $1.2 million in county funds, $6.6 million in state funds. The cost of the first digester, planned for Waunakee, is estimated at $18 million. Falk, in a response letter, called Peck “one of my heroes” but begged to differ with his analysis. Falk, noting that Dane was the only one of the state’s 72 counties to ban the spreading of manure in the winter, said the digesters will protect the lakes from runoff and provide a source of clean energy. Plus they will add “good, high-paying construction jobs” for construction and maintenance. Editor’s note: This article mentioned that Roger Bybee’s efforts to get answers from the Wisconsin Dairy Business Association executive director Laurie Fischer and and information director Peggy S. Dierickx proved futile. Actually, Ms. Dierickx left the employ of the Dairy Business Association during this period, and was involved only in initial contacts. She was ultimately not responsible for the difficulties we had getting information.